Everybody in these days knows Bruges, if not through personal knowledge, at any rate by hear say. Bruges, the Northern Venice of the Middle Ages, known as such by virtue of its world-wide commerce and the splen­dor of its Courts under the Counts of Flanders, and later under the Dukes of Burgundy. Over seven and a half centuries have elapsed since Thierry d'Alsace, Count of Flanders, as a fitting reward for glorious deeds performed in the Holy Wars, received from Baldwin III., King of Jerusalem, and the Patriarch of Jerusalem, a portion of the precious relic preserved in the Church of the Holy City­ a relic whose sacredness and virtue called forth all the intense religious enthusiasm and ardor distinguishing the followers of Peter the Hermit in the eleventh, twelfth, and thirteenth centuries. And what wonder, when the world­ famed relic was no less than some of the blood of Christ! Tradition shows that it was through Joseph of Arimathea that the Church obtained this relic. He it was who took the body of Christ down from the cross, and who, after reverently bathing the sacred wounds, preserved the blood which had sprung there from; his descendants even­tually handing their precious heirloom over to the safeguard of Mother Church. Relying, therefore, firstly on the enormous probability of anything connected with the Savior during His earthly life being devoutly sought for and treasured by the early Christians after their Master's death; secondly, on the decided conviction given in endless historical documents by those great in learning and wisdom of the Eastern Church; and lastly, on the assertions of the historians of the Holy Land, the Church considers it a fact, based on solid and well founded grounds, that the relic it pays such intense and devout veneration to in the May of each succeeding year in the ancient capital of Western Flanders is actually and in­contestably the Blood of our Lord. Thierry d'Alsace brought it to Bruges in 1148 with all the pomp and circumstance be­fitting so precious a gift. 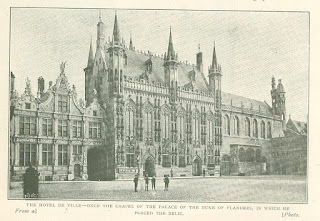 He placed it for a while in the private chapel attached to his Palace on the Bourg; I give a photograph of the Palace, which is remarkable for the elegance and delicacy of its architecture. It is now used as the Town Hall. In the right hand corner of this photo. you see the Chapel of St. Basil, where the relic was eventually placed, and where it is to be seen to this day, at any time, for the modest sum of fifty centimes. The lower part of this chapel dates from 1150. 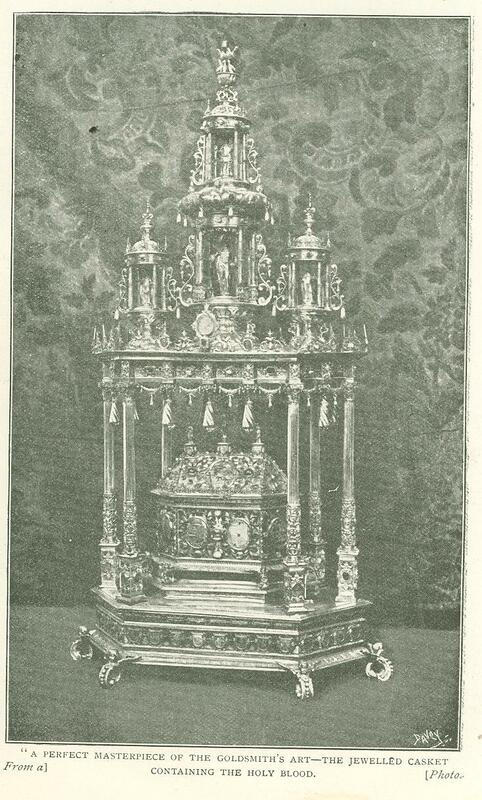 The Holy Blood was kept there for close on four centuries. In 1531-1533 the upper chapel, part of which is said to have existed in 1482, was finished, and the relic placed in it. Whenever their sacred charge was in serious danger of falling into irreverent hands, the guardians thereof - known as the Guild of the Holy Blood - rose in a body to withstand any and every attack made upon it. 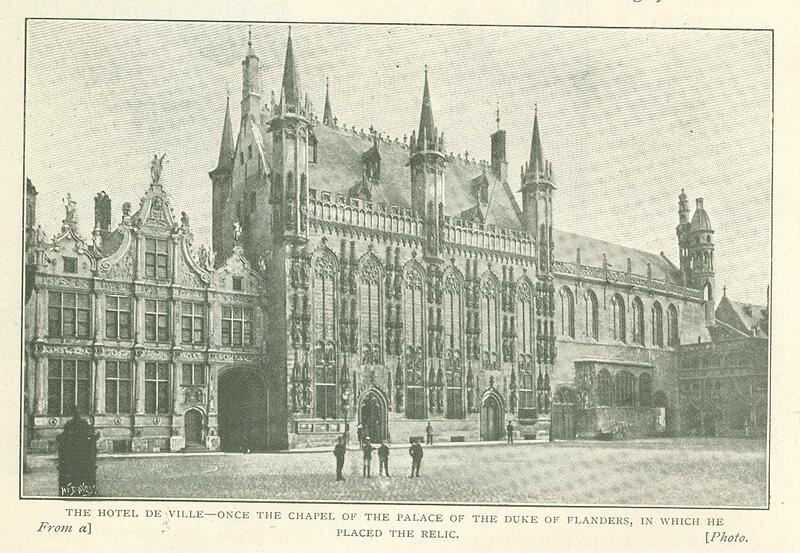 In 1578 a band of iconoclasts from Ghent made a forcible entry into Bruges, and began a systematic course of sacking and pillaging every church and chapel in the place. The relic was only saved by the vigilance: of a Spanish member of the Guild, one Don Juan Perez de Mal­venda, who, seeing the danger it was in, carried it off in the folds of his cloak to his own house, and hid it in a place of safety until the storm was past. Once again, in 1792, when the French Revolution was at its height, and the French them­selves in Bruges, did the good citizens shake in their shoes for the safety of their beloved treasure. The chaplain of St. Basil conveyed it, first to the Episcopal Palace, and then to a certain Richard Godefroit's residence, where it was blocked up in a cavity of the wall until the following year. Again in 1795, when the san­guinary law of suspects was promulgated, and terror reigned predominant in every heart, the vial containing the Holy Blood was packed into a strong box and sent with others holding Church treasures into Holland for a time. 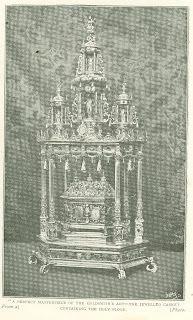 Later in the same year, however, the relic was brought back. From 1795 to 1819 it was carried from one hiding place to another in Bruges itself, when, all danger over, it was finally restored once more to public veneration, although not to its ancient resting place. In their senseless fury against everything relating even to the very word "religion," the Revolutionists had practically demolished the Chapel of St. Basil, leaving merely the outer walls standing. In 1819 its restoration was begun, and in 1824, the lower part being finished, Bruges placed her precious relic once more within its walls. Every Friday morning throughout the year the relic is exposed to the veneration of the faithful from the first morning mass until after the last, which is said at eleven o'clock. The next. photo. represents the reliquary in which is preserved the Holy Blood, faint traces of which can be discerned through the cylinder. Most of the precious stones studding it were presented by the Archduke Albert and the Archduchess Isabel of Burgundy, in the begin­ning of the seventeenth century. 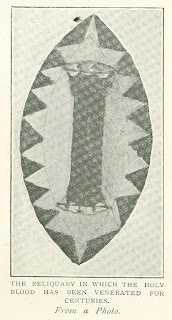 In order that it shall run no risk of falling, when removed from the "chasse" in which it lies all through the year, the priest first fastens a long silver chain to both ends of the reliquary, and then puts the chain round his neck, before taking his seat at the improvised altar in the chapel. To this altar, every Friday, those who desire to kiss the relic stream one after. the other, the priest holding the re­liquary in one hand; and as each person passes on after performing his or her act of veneration, he wipes the relic with the hand­kerchief which he holds in the other. Many are the miracles vouched for by faith in the authenticity of this sacred relic! I can quote but one - produced, however, by a totally different cause from that of faith. The miracle is authenticated by a "bull" issued by Pope Clement V, in which he assures the faith­ful of the fact that the Holy Blood. liquefied about six o'clock every Friday evening throughout the year, until 1309-1310, when this wonder ceased owing to the act of some disbelieving ruffian amongst the pious crowd flock­ing up to kiss the sacred relic. One Friday morning this sacri­legious man, when it came to his turn, dared to mutter horrible blasphemies against the Holy Blood and the death of the Savior, as he stooped over the reliquary. The instant petrifaction of the blessed relic was a clear witness of the wrath of God at this abominable sacrilege. Only on one occasion since that date has the precious blood been known to liquefy. That was when, having replaced the outer cylinder of ­the relic by one of purer crystal, the chief magistrates prayed the Bishop of Ancona to­ perform the ceremony of translation. He was in the act of doing so, when the Holy Blood, up till then a compact and congealed mass, suddenly changed color, became a brilliant red, and several drops slowly detached themselves one by one from the whole. And now for a description of the Procession of the Holy Blood. I was awoke between five and six o'clock on the morning of the 8th (the procession always takes place on the Monday after each 3rd of May) by a large school of girls passing beneath my window, praying aloud as they followed the line of march the procession takes several hours later. From that hour onwards there was a constant stream of pilgrims along the same route, of every age and rank, all telling their beads, and the majority of the men bare­headed. What with these pious folk, sight­seers on foot and in carriages, and bicyclists without end, the cobbled and often moss grown streets of Bruges are well-nigh impassable on this day; and as I gaze down on the multitude, from the friend's window at which I am com­fortably installed about the time the procession is supposed to come by, I breathe a silent prayer of thanksgiving that it has not fallen to my lot to have to join the crowd below. The world, as personified by the Brugeois them­selves, and by those who have flocked within their gates for the occasion, is on the tip­toe of expectation. Flags are waving from every house; bells are tolling (chief of which is the great bell in the belfry known as the "Bourdon "); and there is not a window on either side of the street my friend's house stands in which is not crammed with expectant sightseers. From my point of vantage I can see a fair portion of the great marketplace, with its quaint houses and old-world air. My next photo. shows the belfry, or "Halles," on the top of which, in honor of the day's festivity, has been placed a large fir tree, from which floats the red, yellow, and black national flag of Belgium. The fine old building, which dates from the thirteenth century, towers solemnly above all the worldly frivolity of the sweet booths, "Montagnes Russes," shows, and what-not of the yearly fair, which takes place every May and almost fills the Place. The "Halles " contains one of the finest" carillons," or chimes of bells, in all Europe. 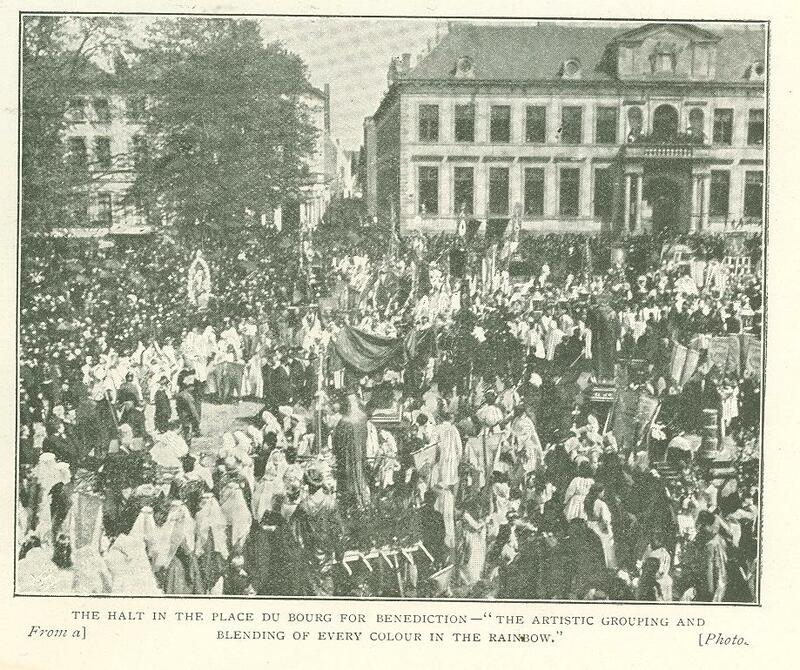 As I stand at my window, meditating on the splendor, now long decayed, of the Bruges of olden days, there comes a sudden break in the crowd, surging out beyond the street I am in, at the opposite end of the market square; and I hear a sound as of martial music in the distance. Every head is craned in the direction from whence it comes, and every soul in the living mass below me is all agog. 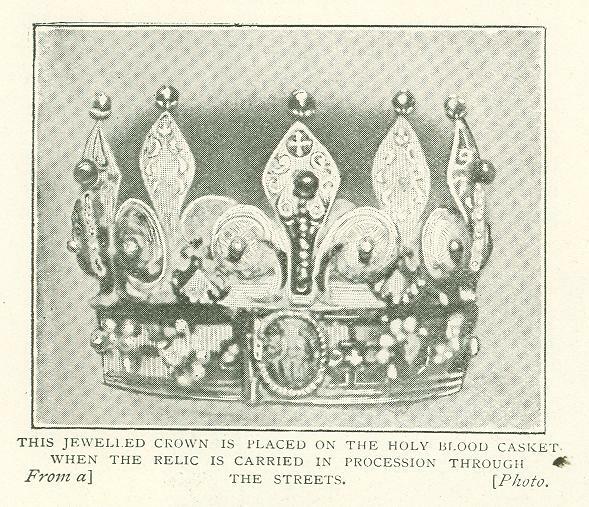 The holy relic, having been conveyed by the clergy from its chapel to the Cathedral, and High Mass having been said by the Bishop, the procession has formed, has already made the round of several streets, and is now close upon us. Following the example of my neighbors, I, too, crane my head out of the window and, looking up towards the marketplace, see the red plumed brass helmets and gold braided uniforms of the Lancers, as they make a broad way through the immense crowds, which fall back on either side to avoid the horses hoofs. The next photo. depicts but faintly the effect, picturesque and striking to a degree, which the entire cortege produced as it wound in and out through the huge con­course massed in the spacious Grand Place. The Lancers' pennons wave gaily and their band plays inspiriting strains. The whole atmosphere is full of commotion and music. As the head of the pro­cession draws nearer, I perceive that a priest on foot, in surplice and biretta and rosary in hand, leads the way, now and then turning to address a word and a smile to the foremost of the Belgian "Tom­mies " behind him. Reeds and rushes are scattered freely by the residents in the houses on either side of the street, in front of the cavalcade. Then come in quick succession (for the sky looks threaten­ing) one group after another, represent­ing the various parishes of this Cathedral town. They are typical of the lives of their different patron saints, and one and all are remarkable for the beauty of grouping and coloring of dresses. Three Mary Magdalens pass by­ one depicting her as she was before her conversion, and the other after; whilst the third shows her leading a life of penitential mortification in Provence, surrounded by angels. I behold also a brilliantly attired St. Margaret, robed in red plush and ermine mantle, tread­ing the earth once more, venerated as a martyr to her faith. Our next photo. shows a recumbent figure. of Christ in the Sepulchre, surrounded by Crusaders in full war ­paint and Knights of the Order of St. Sepulchre. One of the Church's most powerful and noble patronesses follows hard in their footsteps - one of our own Kings' daughters, Walburga, canonized on her death. And yet another personification of her passes by directly after, robed as Abbess of Eichstadt, in the midst of her nuns. Exigencies of space forbid my entering as fully as I could wish into details of this lengthy and very interesting pageant. I will, however, touch lightly on some of its chief features. Behind the band of the Garde Civique, which is led by the tambour-major - a huge man in dark uniform and enormous bear skin stream more queens, martyrs, hermits, saints, and virgins, all representa­tive of the Church at various stages of her existence, interspersed by statues of the Madonna, her Mother, St. Anne of the Sacred Heart, St. Joseph, and countless others. Banners there are, too, gorgeous in their splendor of embroidered velvets and embellish­ment of precious stones; angels both great and small, with hair elaborately curled, white dresses stiffly starched, white wings already sprouting from their shoulders, and bearing before their sweet persons Latin and Flemish mottoes, or baskets and bunches of flowers. The town band goes by; and now comes into view a double line of white surpliced priests in birettas, students from the Bruges seminary, a choir of fresh boy­ voices singing a hymn of praise to that which is close behind them; whilst more boys and a dozen tonsured priests swing costly cen­sers, wafting clouds of perfume up to my quaint window. The next thing I see through these delicious clouds is that to which all the honor and glory of this magnifi­cent procession is due - the Blessed Blood itself contained in an ex­quisite "chasse " (casket), borne by two priests on their shoulders. It is a perfect chef d'auvre of the goldsmith's art, and the work of a master goldsmith, Jean Crabbe, who finished if in 1616, when it was presented to the township of Bruges by the Archduke Albert and Archduchess Isabel of Burgundy. The reader will see by the photo. here given of it that it is a hexagonal coffer, composed ­entirely of silver gilt, richly engraved and covered with enameled shields, precious stones, pearls, and cameos of great antiquity. The four statuettes above the "chasse" represent Christ rising from the tomb, the Blessed Virgin, St. Basil, and St. Donatius. All four figures are of massive gold. The relic is always placed in this magnificent "chasse" when carried processionally through the town; and on the day of the annual procession alone is the gorgeously By the way, I was told by one of my own countrywomen (at procession time the English Colony musters in full force, on balconies, at win­dows, and in streets) that it had rarely been known to rain on the day of the procession, and that when it did, the Brugeois considered it in the light of a bad omen for the prosperity of their town. Presently I join them on their way to the square where stands the Hotel de Ville. This square is called the "Bourg." Under the trees stands a statue of Jean van Eyck, and in the buildings surrounding the "Bourg" you see a curious diversity in the style of the architecture. I arrive in time to find the Benediction about to be bestowed. A more picturesque sight I rarely, if ever, saw. The next photo­graph gives a view of it -although, to see it to its greatest advantage, one must be actually present to appreciate the artistic grouping and blending of every color in the rainbow. I stand in the midst of pilgrim fathers with their staves, and of the Apostles surrounding a man personifying our Lord. Near me stands a tiny St. John the Baptist in flesh ­colored tights, a sheep skin his only covering. 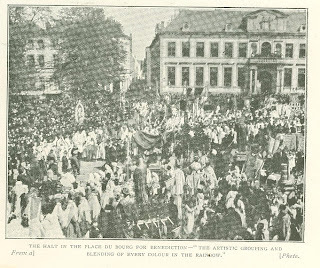 Farther on are grouped girls and boys in the costumes of every nationality on earth - all bear­ing testimony to the widespread power of Mother Church; and close at hand is a group of young girls, veiled in white and wearing many colored robes, each bearing a cushion on which are placed the various symbols of the Crucifixion, viz., a sponge, a hammer, dice, nails, and so on. A statued group of Christ after the descent from the Cross; Our Lord lying in His Mother's lap; and a silver "chasse" containing a fragment of the Holy Cross - both resting on stalwart shoulders - are just behind me. Priests, banners, all the different groups, and the soldiers' uniforms help to make a wonderful spectacle, as they stand massed together in the old "Place," which has seen the same sight (with very occasional breaks) ever since the year 1303, when this remarkable procession was instituted, to which Emperors and Kings, with their Royal Consorts, Archdukes, and the great of many lands have paid the tribute of their presence; not forgetting the present Pope, when he was Apostolic Nuncio at Brussels in 1844 (a fact the devout Brugeois love to dwell on). A wonderfully fine sight, indeed, recalling visions of the days of long ago. The last photo. shows the final act in what has been a long and tiring morning for most of those taking part in the procession. It is no small matter walking over the uneven cobbles of Bruges, under the weight of heavy statues and huge banners. The Lancer band fills the air with music, until the Bishop mounts the steps of the gor­geously colored altar, erected in front of the grey old Hotel de Ville for the occasion. Then comes an almost complete silence among the tremendous crowd around me, as Monseigneur, surrounded. by lesser dignitaries of the Church, turns and raises the holy relic itself in blessing above the kneeling multi­tude, all of whom cross themselves devoutly. A roar of sound succeeds the silence! The Church groups disperse, the bands play them­selves off the "Bourg," each to a different air; the besandalled and brown-bearded Carmelite monks who have taken part in the morning's proceedings stream by me in their coarse brown robes, one of them bearing aloft a painted wooden cross, on which are displayed the signs symbolical of the Crucifixion; the crowds hurry off to seek shelter from the now fast-falling rain, and the great ceremony is over. 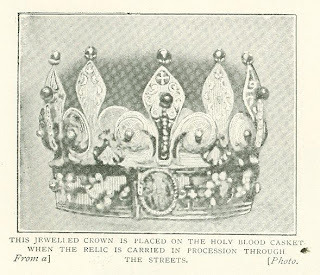 It only remains for me to add that it is greatly owing to the courtesy of Monseigneur Bethune, Canon of the Bruges Cathedral, that I have succeeded in obtaining so many details concerning the history of Bruges' most sacred relic.